Achieve smooth, beautiful skin in two minutes with no recovery time. Dr. Dennis Gross’ iconic renewing peel is an easy and safe at-home version of peels he uses on patients at his NYC practice. Step one is packed with rejuvenating, powerful, yet gentle exfoliating acids. Step two controls the alpha hydroxy acid activity, delivers anti aging actives, nourishes, and keeps skin balanced, smooth, and radiant. Skin immediately looks refreshed and perfectly prepped for a more effective skin care routine. Expect to see improved texture and diminished fine lines with continued use. This universal formula contains a combination of five acids, ideal for first-time peel users and those of all skin types. Once a day, apply step one pad to clean, dry skin, using circular motions. -Continue application until pad feels dry. -Wait two minutes. -Follow with pad in step two using the same technique as step one. A fast-acting, two-step daily treatment for clinical results at home.Our effective dose of 5 AHA/BHAs plus antioxidants and vitamins lift awaydead skin along with excess oil & impurities, while improving uneven tone &texture. 2 minutes to smooth, beautiful skin. Experienceimmediate radiance and see beautifully transformed skin with regular use: yourpores look smaller, lines fade, and your skin looks more even and balanced.The rest of your skincare absorbs faster and makeup goes on better forageless-looking skin. For optimal results, use daily AM or PM. First time peel usersmay apply every other day until skin becomes acclimated. Massage Step 1 onto clean, dry skin until pad is dry. Wait two minutes. Repeat with Step 2. 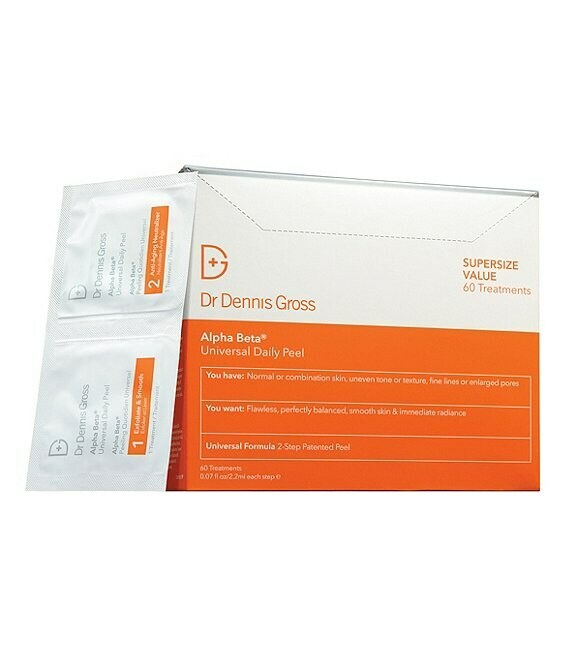 To further enhance results, follow with a serum and moisturizer of your choicefrom Dr. Dennis Gross Skincare™.